Monk was a jazz pianist at Minton’s Play House, a major modern jazz venue in New York City during the early 1940s. He was a prime mover of bebop, which took the era’s “swing” style in new and adventurous directions. An enormously prolific composer, he created works of jagged, angular complexity, full of odd harmonies and “wrong” notes, with strangely accented rhythms, and always supremely inventive and intriguing. 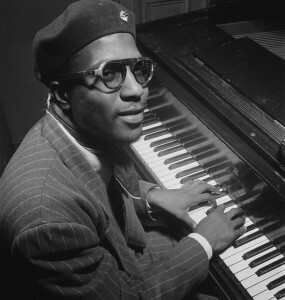 His bestknown compositions—including “Well, You Needn’t,” “Straight, No Chaser,” “Mysterioso,” “Epistrophy,” “Blue Monk,” and “‘Round Midnight”—are considered monuments of modern jazz.